Dr. Charles Mayo has said, “preventative dentistry can add 10 years to human life.” However, it is estimated that as many as 75% of US adults experience some degree of dental fear, from mild to severe. What if you’re terrified of going to the dentist? Relax. You’re in the right hands. If past dental fear, a gag reflex or difficulty getting your mouth numb has prevented you from taking care of your dental health and smile, with sedation dentistry we can make treatment easy and comfortable. Sedation dentistry simply requires taking a small pill prior to treatment to create a relaxed feeling and have virtually no memory of the visit so you remain conscious yet do not feel pain during treatment. Dr. Rohm and staff will listen to your concerns and work with you so that together we can understand your needs and address the reasons why you have dental disease, as well as present the treatment modalities available. Together with you, we formulate an individually-constructed and scientifically-sound plan to stop the cycle of dental disease and restore you to optimum dental health. We encourage an early, positive relationship with children. This helps to ensure healthy dental habits at home. We recommend your child accompany you to your check-up appointment prior to their first visit. This lets them become familiar with the environment and what goes on. We promote preventive dentistry. Regular check-ups help you build a strong foundation for good dental hygiene. Monitoring wisdom tooth growth can prevent unnecessary pain and infection. Orthodontic referral is available. Restoration services which correct dental work that has become weak and unattractive are offered. Procedures are available that can help prevent tooth loss and the need for dentures. We can replace missing teeth or help secure existing dentures by using implants. Implants can make dentures more stable and secure. 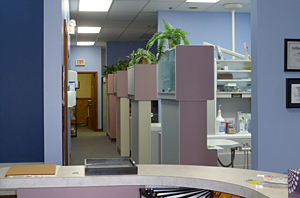 If you have any questions about your dental health, sedation dentistry or any other concerns, please contact Dr. Rohm. Thank you.